Hey Y'all! Happy Friday! Today is a super exciting day because as you read this I am off to spend a fun-filled weekend in the big city with my sister, Living Like Randalls, and her family. However, I couldn't leave without leaving you with something delectable to drool over. Oh, and did I mention this Sweet and Spicy Glazed Salmon dinner only cost me $5 to feed two people! No! I'm not kidding! FIVE DOLLARS! If this is your first time visiting The Kitchen Wife, this post is going to look a little different than I usually post. 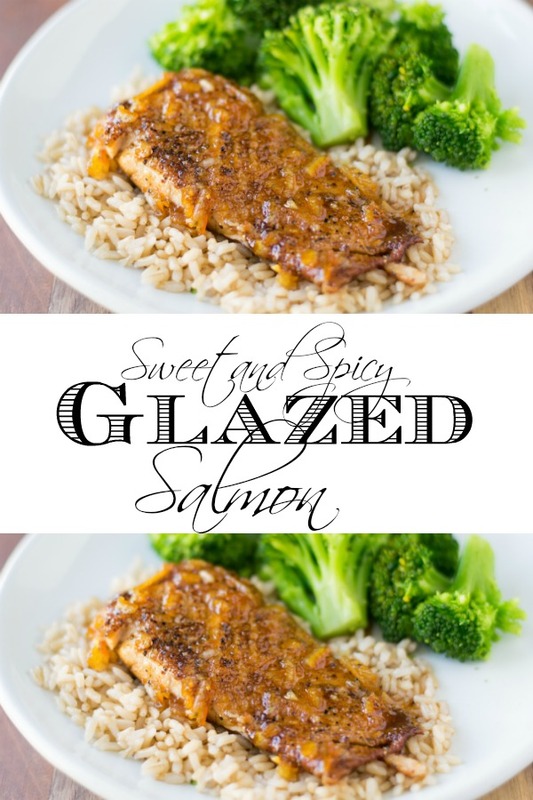 Normally I would give you step-by-step photo instructions with each recipe, but since I did a video for this Sweet and Spicy Glazed Salmon, I'll just link it down below. You can feel free to click on it to watch the tutorial. 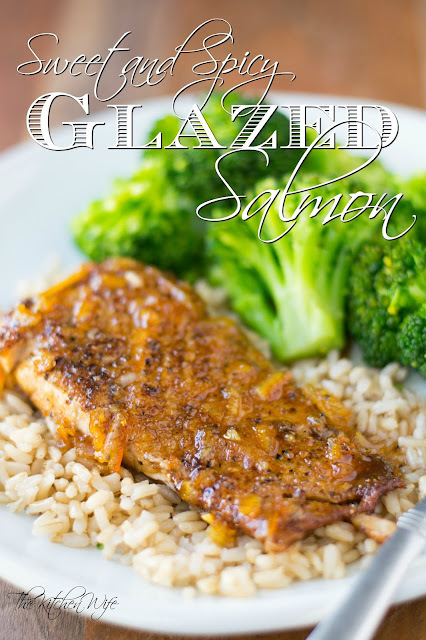 Season the salmon filets with 1 tsp of Cajun seasoning. 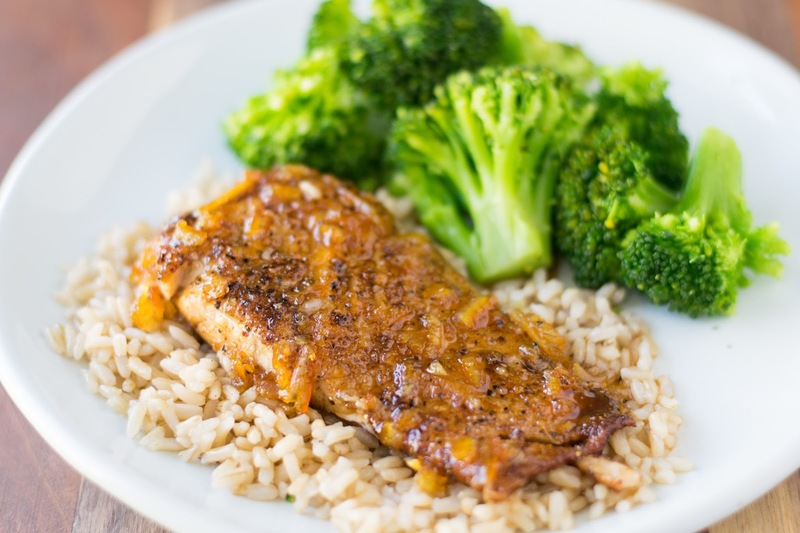 In a sauce pan combine the orange marmalade, 1 tsp of Cajun seasoning, and water. Place the sauce pan over medium/high heat and bring to a simmer. Simmer for 2-3 minutes until sauce thickens. Remove from the heat and sit to the side. Place a pan over medium/high heat and add 2-3 Tbsp of oil. Allow the pan to get HOT. Place the salmon filet, skin-side-down, in the pan and cook for 3 minutes. After three minutes, gently flip the salmon filet over. With a fork, gently lift the skin from the filet and discard. Let the filet cook for 2 more minutes. Flip and allow the bottom to brown for one minute. GENTLY place the filet into the sauce pan of glaze and brush the glaze all over the filet. And it's that simple! Now of course you don't have to use Dollar Tree Salmon for this recipe. You can use any salmon you fill comfortable with, but bottom line, this Sweet and Spicy Glazed Salmon will be one of the BEST things you put in your mouth...EVER! I know you are going to love it so get in the kitchen and make it TONIGHT!